During the past three years, about fifteen planetary companions have been discovered in orbits around dwarf stars. They have revealed to astrophysicists a broad diversity of planetary systems at other stars. Giant planets with masses ranging from half to several times the mass of Jupiter, the largest planet in our own solar system, have been detected with various telescopes. The orbital periods range from 3.1 to 1650 days; while some of the orbits are of circular shape, others are very elongated. The observed diversity naturally raises questions about how these exoplanets are formed. Now, following only a few months of observations, a Swiss team of astronomers , working with a new Swiss astronomical facility at the ESO La Silla Observatory mainly dedicated to the search for exoplanets, has made its first planetary detection. It is a massive planet moving in an almost circular orbit around a nearby star that is itself the primary component of a double star system. 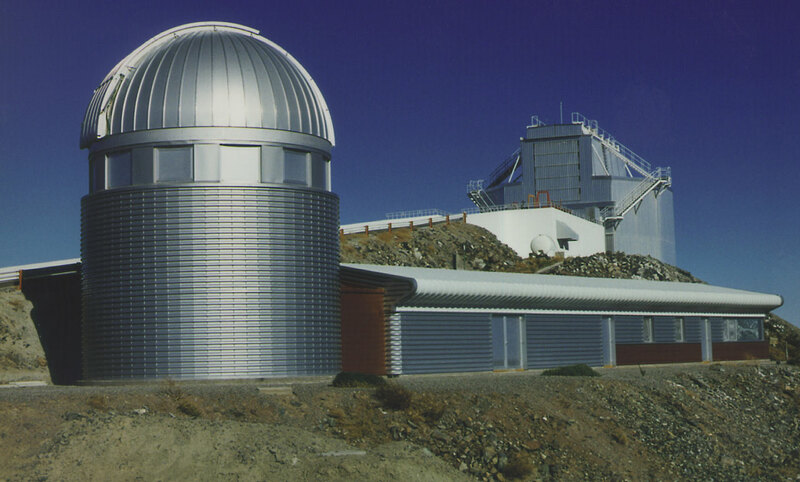 In June 1998, the CORALIE echelle spectrograph was mounted at the 1.2-m Swiss telescope at La Silla and the commissioning phase was begun, during which the telescope and the spectrograph would be trimmed to perfection. This facility is specifically designed for high-precision radial-velocity measurements and it will mostly be used for an ambitious search for large extrasolar planets around stars in the southern celestial hemisphere. Over 1000 stars will be investigated. Such a vast observational programme is only feasible with a very accurate and efficient instrumental combination. 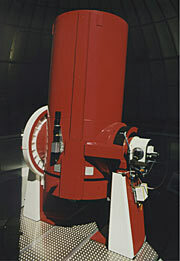 The new Leonard Euler telescope with a 120-cm main mirror was built at the Geneva Observatory and named in honour of the famous Swiss mathematician (1707-1783). The CORALIE spectrograph was developed through a collaboration between this observatory and the Haute-Provence Observatory (OHP) in France. 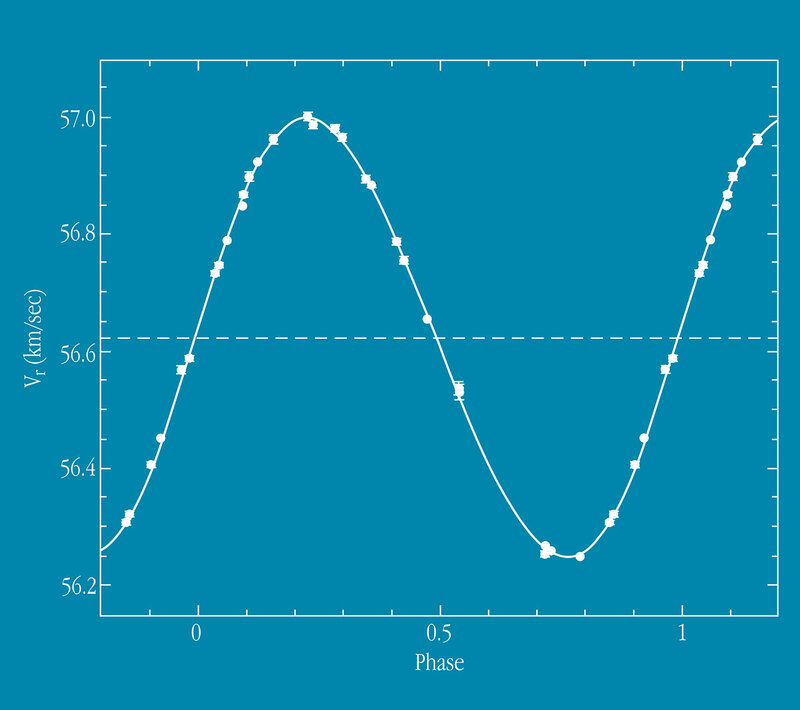 It is an improved version of the ELODIE spectrograph now in operation at OHP, and with which the first extrasolar planet was found around the star 51 Pegasi, three years ago. Compared to its predecessor, CORALIE has increased spectral resolution, as well as a more efficient light detector. It also has improved instrumental control that features complete on-line data reduction and analysis. CORALIE is so accurate that it can measure the motion of a star in the direction of line-of-sight (the "radial velocity") with a precision that is better than 7 m/sec or 25 km/hour, i.e. about the speed of a fast human runner. While still in the commissioning phase, very valuable scientific data have been gathered for the star known as Gliese 876 , the closest and lightest star with a planetary companion found so far. And just as the new facility has become fully operational, it has already yielded its first extrasolar planet discovery. Discovery of a heavy planet in orbit around "Gliese 86"
Gliese 86 (also known as "HD 13445") is seen in the southern constellation Eridanus (The River). It is a bright, rather cool dwarf star, somewhat less massive than the Sun (about 0.79 solar mass). It is also intrinsically fainter than the Sun (about 0.4 solar luminosity). However, since it is quite nearby - about 35 light-years only - its apparent magnitude is comparatively bright and it is just at the limit of what can be seen with the unaided eye (m V = 6.12). Contrary to most stars with known planetary companions, Gliese 86 contains less metals than our Sun, by a factor of two. Since September 1998, the Swiss astronomers have obtained 29 high-precision radial-velocity measurements of Gliese 86 . A planet in orbit around a star will manifest its presence by pulling the star in different directions, thereby changing by rather small amounts its measured velocity. The orbit of the new planet has a period of 15.83 days. The total velocity variation is 740 m/sec, very easy to detect with CORALIE. 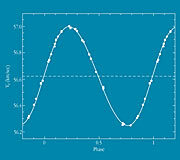 The orbit is slightly non-circular and has a small, but significant eccentricity of 0.05. The dispersion of the radial-velocity values around the orbital solution is only 7 m/sec; this includes statistical errors, spectrograph systematic errors and intrinsic stellar variations. The inferred minimum mass for the planetary companion is 4.9 times the mass of planet Jupiter. The new planet is at a distance of only 0.11 AU (16.5 million km) from the star, i.e. just over one tenth of the Sun-Earth distance. The surface temperature on the planet is quite high, about 380 o C.
It is the second closest exoplanetary system discovered to date. From the long-term drift observed in the radial-velocity measurements during the past 15 years with another spectrograph at the La Silla Observatory, it is known that Gliese 86 is not a single star, but in fact a long-period "spectroscopic" binary system. The separation between the two stars is probably more than one hundred times larger than that between the planet and the star it revolves around. The observed characteristics of the new planet, e.g., its rather large mass and almost circular orbit, associated with this double-star nature, indicate that planetary systems may form in other ways than the standard agglomeration scheme. For instance, recent theoretical calculations by Alan Boss (Carnegie Institute of Washington, USA) suggest that multi-Jupiter-mass planets may be formed through dynamical instabilities in a protoplanetary disk that are induced by the gravitational action of a nearby stellar companion. One important result of this new, extensive survey carried out in the southern sky will be to provide potential targets for the VLTI (Very Large Telescope Interferometer), presently being built by ESO on Cerro Paranal. When it enters into operation some years from now, it will be able to provide exciting additional information about these planets and their nature. The team consists of Didier Queloz (also Jet Propulsion Laboratory, Pasadena, USA), Michel Mayor, Luc Weber, Dominique Naef, Stephane Udry, Nuno Santos, Andre Blecha and Michel Burnet (Geneva Observatory, Switzerland) and Bastien Confino (St. Luc Observatory, Switzerland). The members of team want to express their gratitude to all the technical staff of the Geneva Observatory, in particular Daniel Huguenin, Rene Dubosson, Giovanni Russiniello and Charles Maire for their great efforts, from the design to the final installation of the Swiss Leonard Euler telescope at La Silla.